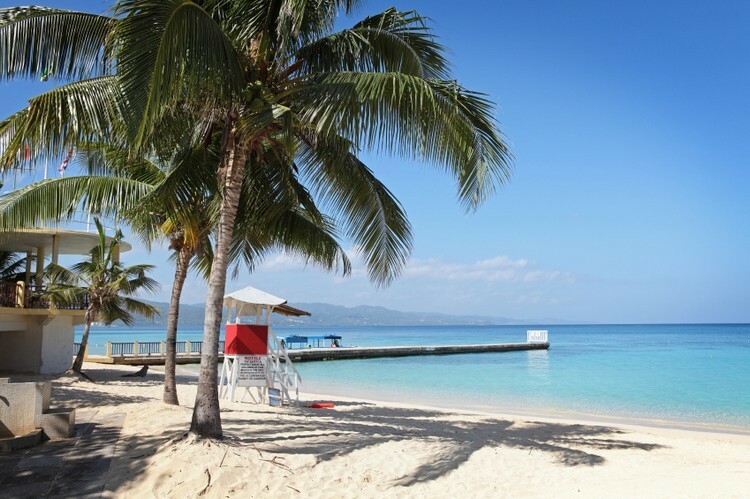 Enclosed by a cradle of hills with stunning views of the western coastline, Montego Bay’s lovely beaches are just one of the reasons why it is so popular. Montego Bay is a busy place with the centre of activity centred along Gloucester Avenue which has been renamed the “Hip Strip”, bars, restaurants and gift shops line most of the avenue. 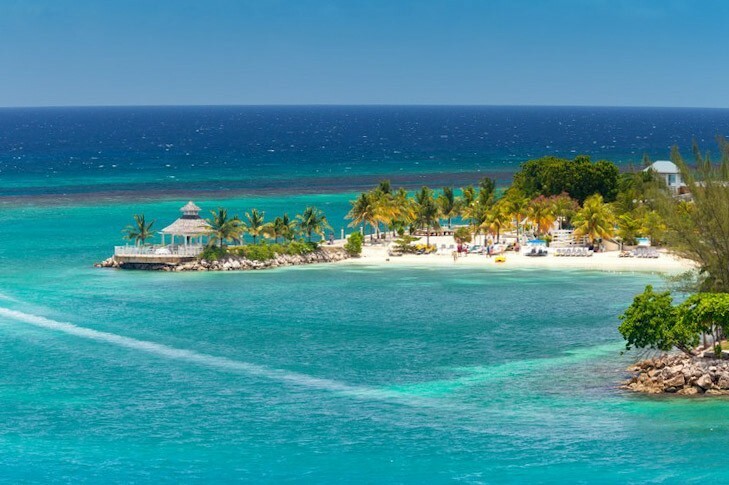 The strip ends with the infamous Margaritaville and soon after this you will come to Montego Bay’s most famous beach called Doctor’s Cave Beach. At the end of the hip Strip, the sea emerges once again with a lovely stretch of beach with some great snorkelling. The era of plantation slavery comes very much to the fore once you travel east of Montego Bay where you will find two palatial great houses that have been opened up as tourist attractions. Closest to Montego Bay is Rose Hall which was the former home of the “White Witch” Annie Palmer. She came to Rose Hall as the wife of its owner John Rose Palmer and is reputed to have murdered him and two more husbands after him as well as numerous lovers. The “White Witch of Rose Hall” has fascinated generations, and even today, there are those who claim to see Annie passing through the Great House. The supposedly haunted house has day and night time tours both of which are really fascinating. Greenwood Great House is more interesting in terms of its architecture than Rose Hall. It was built in 1790 and is a beautiful building and definitely the greatest great house in Jamaica. It commands amazing coastal views and filled with original fittings and curiosities. Greenwood great house probably has the finest antique museum in the Caribbean. 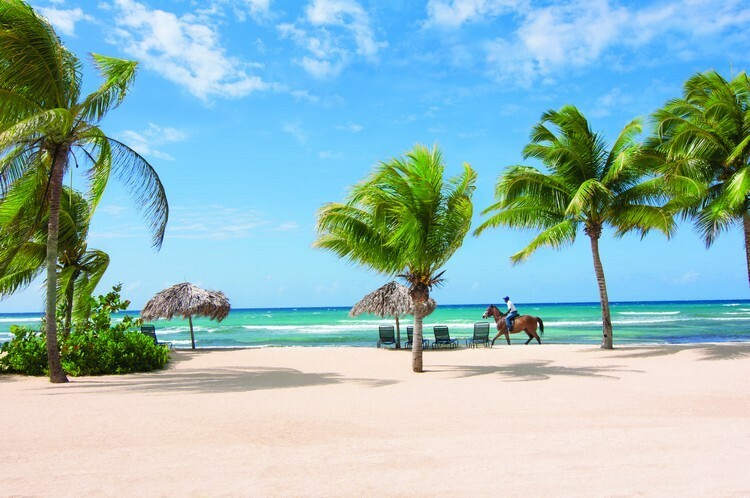 There are many opportunities to go horse riding around Montego Bay. Chukka Blue has excellent horses and guides which is 5 minutes west of Tryall. You can start with a ride in the mountains; end with a gallop on the beach. There is another Chukka Blue near Ocho Rios. 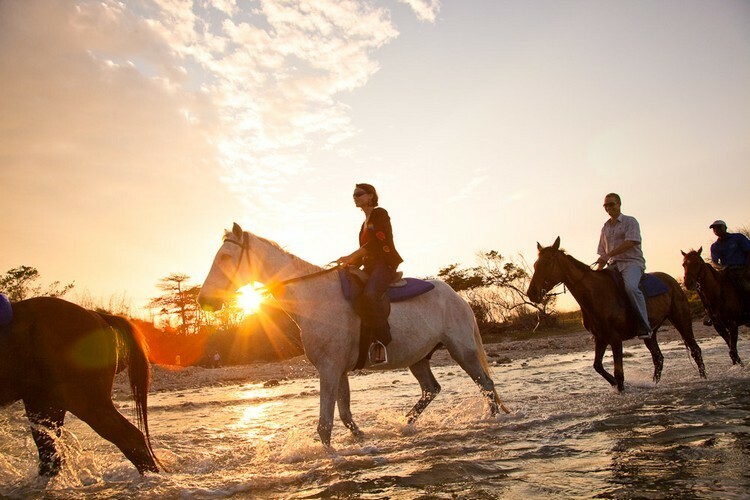 At the resort at half moon bay horseback riding is facilitated by an excellent equestrian centre with sand arena and you will find mountain riding at the Rocky Point Stables. Doctor’s Cave Bathing Club features white sands and crystal clear water right in the centre of Montego Bay’s Hip Strip. Dr Alexander McCatty donated Doctors Cave as a bathing club in 1906. The seawater is reputed to have curative powers. This is a great day out aboard a sight-seeing or sunset cruise on a 53-65 foot sailing catamaran. There is an open rum bar as well as dancing and foot massages. There are plenty of tennis courts for day or night play at Half Moon, Holiday Inn, Racquet Club and also for members only the Tryall Club and Round Hill. See the grandeur of Jamaica's mountains and coastline by helicopter. Approx $750 per hour. Dating back to 1655, Appleton is the oldest rum distillery in Jamaica. Its rums are considered by many to be the best in Jamaica. The tour takes you around the factory and explains the whole production process. You will also get the opportunity to sample various rums. This is a great soft adventure facility which offers horseback riding, mountain to sea bicycle rides, Jamaican Bob sled, ATV Safari and jeep safaris. Here you will find the remains of an old fort on a hill overlooking the harbour. It is also home to Fort Montego Crafts Market. This is an infamous Sports Bar and disco with big screen TV, water slide and offers a good snack menu. It is a fun place for teenagers and young adults located at the end of the Hip Strip. Located on the Hip Strip, Coral Reef lounge is a great place to enjoy live jazz, reggae as well as cabaret and fashion shows. In addition there are lots of slot machines that range from 50 cents to $5 for jackpots. Very close to Montego Bay in Freeport (where the cruise ships dock), you fill find some great duty free shipping. There is also good shopping located in the Casa de Oro downtown, Half Moon Shopping Village and Holiday Inn shopping arcade. 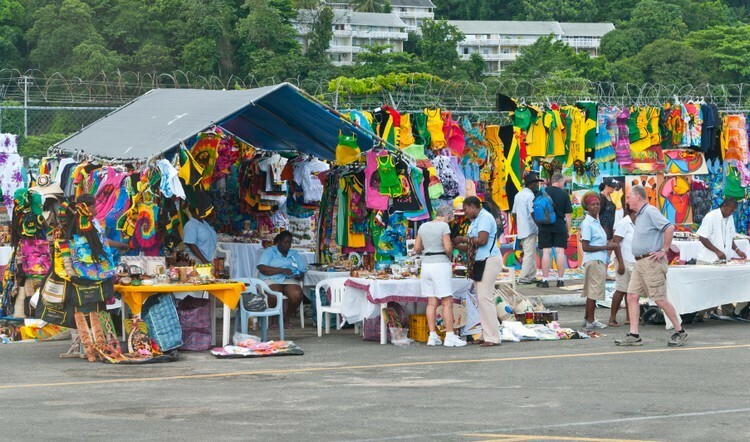 If you are looking for local arts and crafts, you will find them in the big craft markets in Ocho Rios and Negril. Haggling is normal! There is also a great new shopping and entertainment centre called Island Village which has a Margaritaville Bar & Restaurant, concerts, good food and drink and duty-free jewellery stores. In addition there is a Multiplex digital movie theatre, art gallery, coffee shops, boutiques, beach and swim-up bar. There is a modest entrance fee but well worth it. 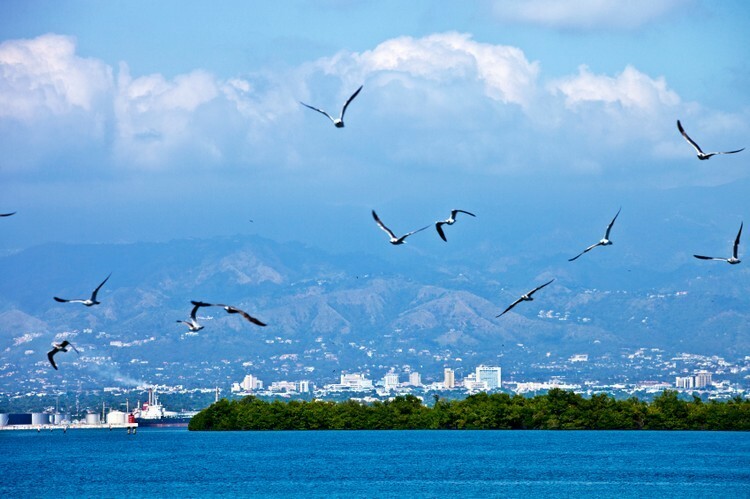 Located about 5 miles south west of Montego Bay, is Rocklands Bird Sanctuary, a low key attraction that offers bird lovers an unforgettable experience. The sanctuary was the former home of Lisa Salmon a celebrated Ornithologist and is now the favoured spot of a multitude of birds that come here each day to feed. Located 550 feet above the sea, the gardens have beautiful views of Ocho Rios and are home to many rare plants and trees as well as a very pretty waterfall. Also with wonderful views, Coyaba Garden’s are more compact than Shaw Park with paths threading past ponds and streams. It also has an interesting museum dedicated to the local history. 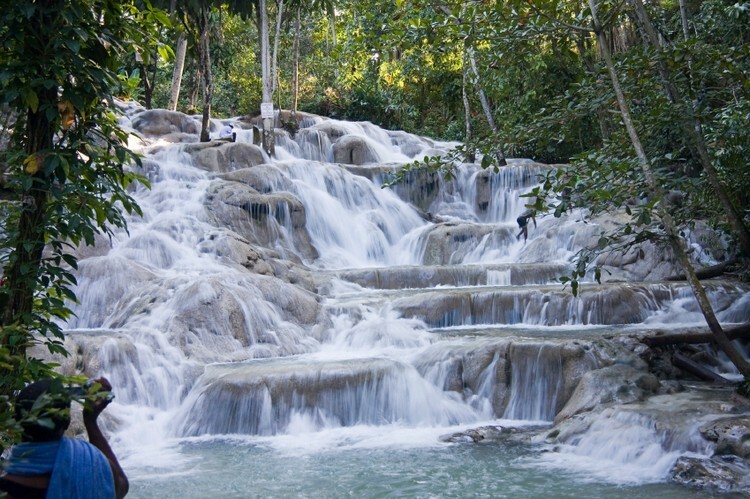 Just west of Ocho Rios is probably Jamaica’s most famous attraction – the Dunn’s River Falls. It is a magnificent cascade of multiple tiers pouring over smooth lime stone rocks, encircled by interesting ferns and foliage and ending at a beautiful cove with white sands and crystal clear waters. There is also a great reef off shore and therefore it’s well worth bringing some snorkelling gear. Climbing up the falls is the thing to do. When you enter you can take a guide who will assist you in finding an easy route up. Remember to wear a swim suit and also gym shoes as you will undoubtedly be drenched by the time you reach the top! Dunn’s Falls is quite touristy and developed (it can get busy when the cruise ships come in) with plenty of car parking and a large craft market at the end but it’s well worth a visit. Practically opposite Dunn’s River is Dolphin Cove which is a kind of Mini-theme Park which provides the opportunity to swim with dolphins and sting rays. You will also get an opportunity to get up close and personal with macaws, snakes, iguanas and goats. Located 22 miles west of Ocho Rios on the main road between The Runway and Discovery Bay, The Green Grotto is an extensive range of limestone caverns with a subterranean lake and plenty of impressive stalactites and stalagmites. The history of Green Grotto is really interesting as they were originally used by the Amerindians as a place of worship and later as a hideout by Spanish troops. Located close to Ocho Rios Mystic mountain is definitely one of the top attractions in Jamaica. There is a really good cable car ride, a zip line, Mystic water slide, infinity edge pool, bobsled track and a restaurant with a great view of the Bay of Ocho Rios! It’s really well done and great for the adventurous at heart. Located 25 miles south west of Ocho Rios, high in the St Ann hills amongst gorgeous landscape of grassy cattle pastures, lies the Bob Marley museum where he was born and spent his early childhood before he moved to Kingston at the age of 13. With a rasta red, gold and green flag flapping in the wind, the compound is centred around the tiny wooden shack where the Marley’s lived. The mausoleum itself is a simple whitewashed building holding Bob Marley’s tomb. Located 40 minutes west of Montego Bay, Negril is one of the most popular parts of Jamaica. 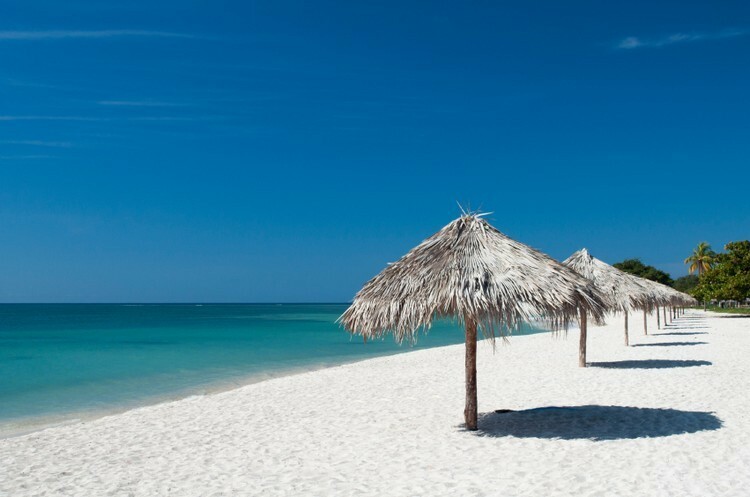 Negril is split between its 7 mile (12 km) of picture perfect white sand, backed by the wide Norman Manley Boulevard and the limestone cliffs that make up the islands extreme western tip. Both cliffs and tip are lined with restaurants and noisy bars giving the area a great reputation for nightlife. The beach and sea in Negril are some of the best in Jamaica. It’s warm almost mirror clear waters are sheltered by a reef making it a great snorkelling destination too. It is quite a touristy area which means that you often get crowds of people and vendors selling everything from hair braids to glass bottom boat rides. If you head east of Negril towards long bay, you will find a much quieter area with a beach park. Here the buildings thin out and the hustle diminishes. 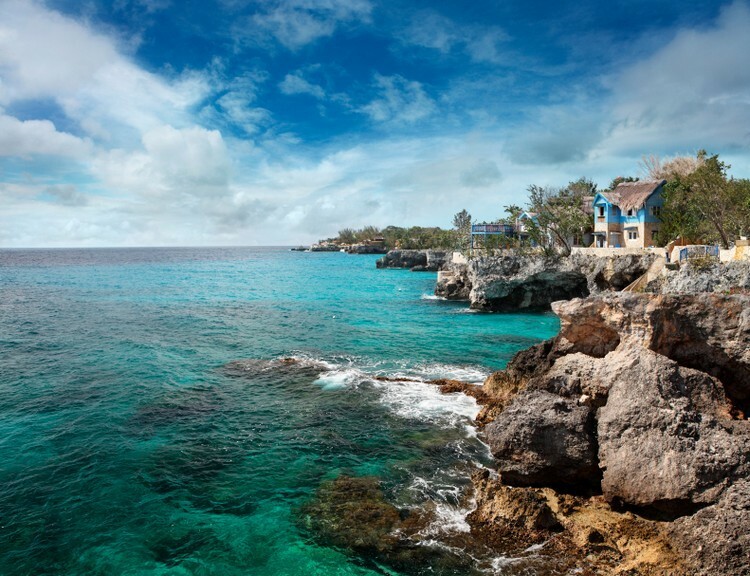 The west end with its stunning cliffs is quieter again with some wonderful Jamaica villas to rent that have created steps down the cliffs to the sea. Located just 2 miles east of Negril, the Great Morass is a peaty reed-covered expanse that provides a habitat for a number of rare animals and plants. There are wooden boardwalks that lead right into the centre of the morass. Here the air is alive with the chirping of crickets, cicadas, frogs and every inch is covered in greenery. Located 5 miles north of savanna-la-mar, is the Blue hole Garden which is a lovely spring water pool overhung with greenery. It is a magical place for a swim and not at all touristy. This is a 500 acre coconut and vegetable plantation that offers horse riding both inland and along the beach. There is also a crocodile reserve and bird sanctuary onsite. Just beyond The Rhodes Hall Plantation, you will find Half Moon Beach which is the polar opposite to Negril. There are no motorised water sports; just a calm cove with hammocks to swing in and a good restaurant. Close to Negril, are these lovely falls which include 22 mini cascades along a greenery shrouded river. There are lots of deep swimming pools to enjoy on the walk up the falls and when you get to the top, you are let through pastures lined with clusters of bamboo. Kingston, Jamaica’s capital spreads inland from a large natural harbour and is cradled to the north by the peaks of the Blue Mountains. Kingston is Jamaica’s cultural and commercial centre. The city is loosely divided into New Kingston and Downtown Kingston. Kingston is host to several tourist attractions and must sees which can be experienced through an organised tour, insuring that you get to see everything and hear information and anecdotes from the locals. You cannot visit Jamaica’s capital without visiting Bob Marley’s Museum – his former home and recording studio – where a combination of memorabilia, numerous writings and photographs tell the life of the King of Reggae. Reggae Sumfest is a festival held every July to celebrate music, the heart of Jamaica, with people attending from across the globe, to experience the excitement of a Friday night beach party to commence the four day festival. Ocho Rios Jazz Festival is also celebrated on the island, being one of the best mainstream jazz festivals in the Caribbean, during ‘Jazz Week’ in June. Over thirty events are held across the island, attracting many tourists, jazz-lovers and locals, creating an incredibly spirited atmosphere.